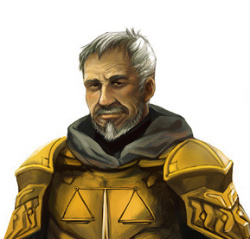 A human in his late fifties, ruddy faced and sporting a short gray-white beard, Yether is the steward of Hommlet’s temple of Pelor, assigned from Verbobonc two years ago. His dedication has ensured that Pelor’s temple has become the fastest growing faith in Hommlet, mainly drawing faithful from the newcomers to the town. He is assisted in the temple by Nerris.